You and a colleague are in a conference room having a great conversation. Every question leads to a brilliant insight, which leads to a terrific idea. You’re totally in sync, building on each other’s momentum—until your colleague says, “Can you email me that PowerPoint file so we can walk through it?” Now you have to interrupt your brainstorming flow to track down that file and email it. By the time you’re done with that task, the momentum is broken. This happens with online team collaboration all the time. A team is communicating in real time, things are getting done, and then someone has to leave the conversation to find a file in a different app. Momentum broken. But with Glip’s team messaging and collaboration tool, your team has free file sharing built right into the app. Momentum…never broken! Glip helps teams collaborate more effectively, even if none of them are in the same room or even in the same state. Teams can create an online workspace where they can message each other in real time, create and manage tasks, and track the details of large, complex projects. But true online collaboration also means file sharing. 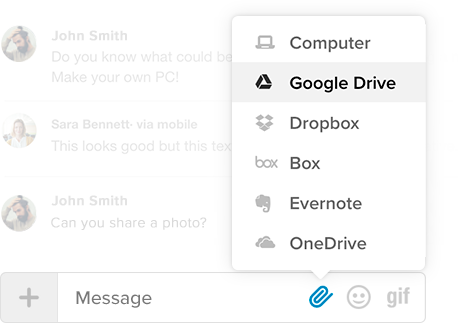 The Glip team messaging and collaboration platform includes its own free file sharing feature, which lets you select files on your computer (or stored in your Glip workspace) to share in your Glip communication stream. 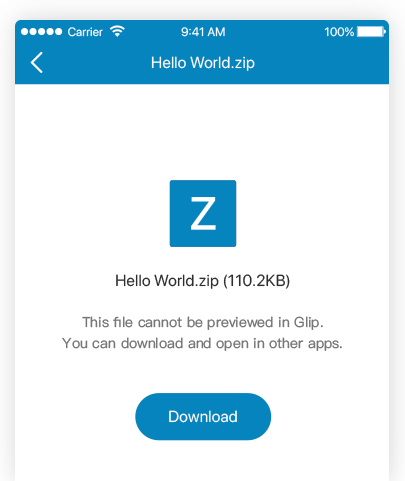 And Glip also lets you pull files from just about anywhere into the app through our integrations with cloud storage tools like Dropbox™, Google Drive™, OneDrive, and Evernote®. Productive teams everywhere love Glip. 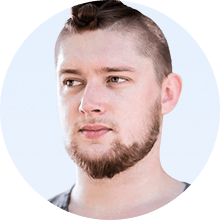 "It’s Glip tasks and conversations for us all day, especially because the work is so deadline driven. It’s really, really tough to get stuff in on time. We wouldn’t be able to do it if we didn’t have a central place where we can see everything on a calendar." 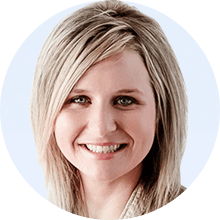 "I always tell people, when they ask me how I run my business and stay so efficient, that it all starts with Glip. It’s my best tool — it’s my ninja weapon." All our teams have very specialized tasks, but they all have to work together. Glip is probably the number-one way they communicate." Free file sharing in your Glip workspace saves time and hassles, helps your team stay organized and keeps the conversation flowing. Task switching. Doesn’t sound so bad, right? But a massive body of scientific research, including a report covered in Psychology Today magazine, has shown that jumping back and forth between complex tasks throughout the day can drain your productivity by as much as 40%. And this enormous hit to your productivity will still take place even if the actual time you spend shifting from one task to another is a few seconds. With that in mind, consider a scenario where you are collaborating with your team on Glip. You’re all reviewing your shared team calendar, sending each other real-time messages about the tasks you’ve completed and are still working on. In other words, you’re all engaged in the task of real-time collaboration on this project. Then someone asks for a file related to one of the tasks on the calendar. Now, if you had no way of pulling that file directly into the conversation, you’d have to leave your Glip workspace and open up another application. In other words, you’d have to task switch. So you’d open the app where you had the file stored—say, your Dropbox account—and you’d grab it and maybe attach it to an email message. (That’s another app you’d have to open!) And now, as you go into your email program, you notice a few new messages and scan them. Maybe you even jot down a quick response to one or two, just to get those tasks out of the way. This happens to teams all the time. They jump in and out different collaboration and communication apps throughout day to get their work done. But what’s really happening is that these app-jumping employees are leaking productivity every time they move from one workflow tool to another. The solution, of course, is to help these professionals accomplish as many of their collaboration and communication tasks as possible in one unified workspace. Which is why Glip includes free file sharing right in the app, so your team can send, receive, preview, annotate, and store any type of file without ever having to leave your Glip workspace. Here are just a few of the ways Glip’s free file sharing can help your team. 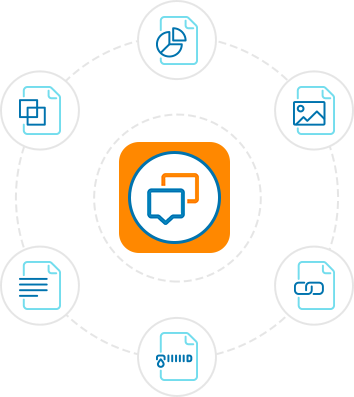 With Glip’s free file sharing feature, your team can save time and energy by grabbing a file and sharing it with a Glip team or conversation in seconds without ever having to leave the RingCentral app. Many of your Glip communication streams are built on momentum, one team member sharing an idea with the group in real time and someone else chiming in with a great follow-up idea, which triggers a flurry of great questions and suggestions among the team. But all of this momentum can be slowed down, or broken altogether, if everyone has to wait while someone leaves the conversation to invite the rest of the team to view their file on Google Drive, or worse, emails it to everyone and asks them all to open it up and review it when it hits their inboxes. This breaks the momentum not only for the person who has to jump out of the real-time communication to find something in another app, but also for everyone else on the team when they have to leave the communication as well to open up their emails. With Glip’s free file sharing this break in momentum never has to happen. Nor does the team ever have a reason to leave a conversation to open their email. Another great advantage of free file sharing in Glip is that it can help your team cut way down on the number of emails cluttering up their inboxes. When you establish a convention that all files related to, say, your team’s editorial calendar in Glip will also be shared in your team’s Glip workspace, you can save yourselves the hassle of hunting for old emails with the attachment you’re looking for, not to mention the version-control issues teams often have when no one is sure which of their emails contains the most current version of a given document. Get your team’s files out of email and into Glip. Another reason not to use email as your team’s primary collaboration tool is that it’s just too easy to lose track of important files that way. Let’s say you need an old version of a document your team had worked on months ago, but you’re not sure which team member emailed it to you or what it was called. Or, instead, imagine you do remember the sender but you still can’t locate the attachment in your never-ending series of email exchanges with that person. When you instead use Glip’s free file sharing feature, you’ll always be able to retrieve a file quickly and easily at any point in the future. If all you remember is who uploaded the file, or what type of file it was, or roughly when they uploaded it, or what conversation or team it was added to, you can use any of these search criteria in your Glip workspace to quickly locate the file. 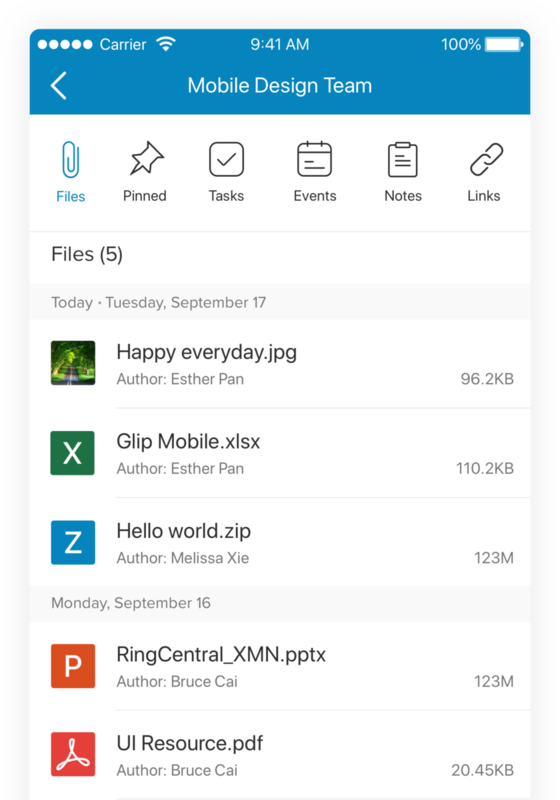 Whether dragging and dropping a file on your desktop into Glip, pulling a file already in Glip into a new conversation, or grabbing a file from cloud storage, Glip’s free file sharing has you covered. When you need to share any type of file—document, spreadsheet, video clip, MP3, or image—with a team in your Glip workspace, the only possible difficulty you might have will be choosing which way to do it. Glip offers a lot of options here. If you’re in a Glip conversation, you can click the little paper-clip icon on the right side of any message field. That will let you search your computer’s hard drive, or a number of other sources (which we’ll explain below), for the file you want to attach. All you have to do is select the appropriate file, and Glip will drop it into your communication stream. 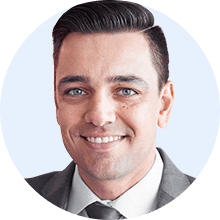 Your team will see it immediately in the conversation, and it will also be stored securely in your Glip workspace where you’ll be able to retrieve it later. Now let’s say you’ve added that file to one Glip team’s communication stream, and a few days later you want to share it with someone else, or maybe add it to a different Glip conversation or event. All you have to do is open your files area on Glip, and you’ll be able to grab the file and drop it into the other team or conversation. If you’re looking for an older file in Glip, and you’re not sure which team you originally shared it with, or when, you can narrow your file search to those you uploaded. 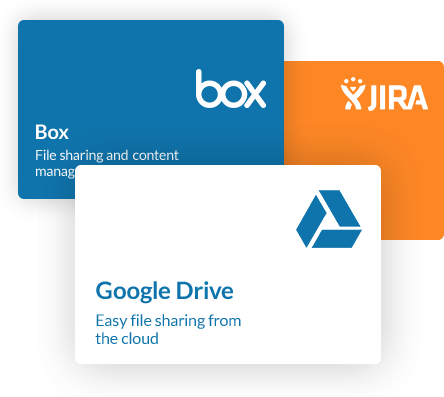 Another way Glip makes free file sharing easier is through our integrations with many of the most popular cloud storage apps—Google Drive, Dropbox, OneDrive, Box, and others. Don’t just share that file, collaborate on it! Whichever method you or a teammate chooses to share a file with your Glip team, say a spreadsheet or a presentation file, it doesn’t have to just sit there. Glip is all about collaboration after all, so we’ve designed your team’s workspace to let anyone (with permission) annotate, update, and add notes to a file. That file and the original can then both be stored in your Glip workspace, meaning your team can collaborate, iterate, and share ideas while still maintaining version control and preserving a record of all changes and suggestions made to the file. This is what true team collaboration is supposed to look like.